I have drank Julian Coffee Roasters flavored coffees at Java Junction (a little coffee shop in Fortville, Indiana). So I was familiar with their coffees but wanted to stop by their roastery near Zionsville, Indiana to learn more. They have been in business for 11 years and have quite the variety and assortment of coffees to offer. But what I was most interested in was some of their new and upcoming products. Julian's is serving up coffee in some really unique ways and has something for every palette. Julian's offers single origin coffees, blends, flavored coffees, teas and cocoas. Their coffee is roasted in a Loring Coffee Roaster which can roast 75 pounds at a time. Julians will soon be offering K-Cups. They have machinery to produce and package the K-Cups and they will be available for sale at Cosco's in the Indianapolis area. One of the coffees I found really intriguing was their Bourbon Barrel Sumatra. Green coffee beans are placed in a bourbon barrel for 2 - 3 weeks and the barrel is turned occasionally to get all those flavors from the inside of the barrel onto the beans before they are roasted. Another new feature Julians has is Draft Coffee. Yes, just like it sounds, coffee that is cold and right out of the tap. 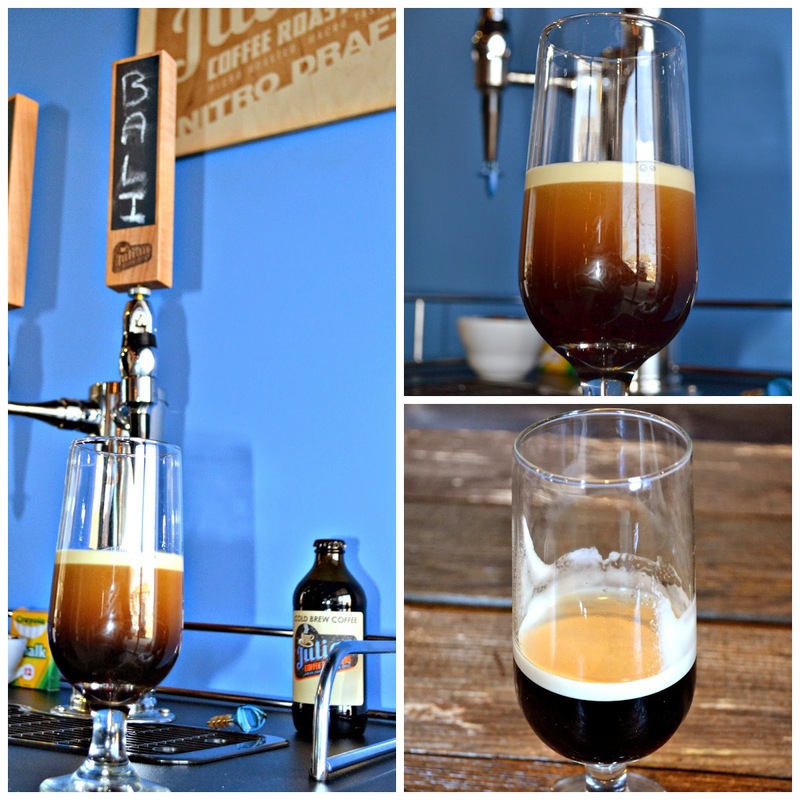 It foams up just like beer but has an iced coffee taste, it kind of reminds me of a Guiness. I thought this was a really unique way to drink coffee and it is currently being served at Bites in Zionsville. Julians also offers Cold Brew Coffee and it is sold in kegs or bottles. Cold Brew Coffee uses coarser ground beans soaked in cold water for extended periods of time making the coffee more concentrate and lower in acidity. I sampled some of this coffee while I was there too and could definitely notice a more robust flavor to the coffee. Lastly, I sampled a traditional cup of coffee from their single origins line....Ethiopian Yirgacheffe which was naturally processed and I found this to be a full bodied cup with fruity notes and a sweet finish. Julian's coffee is available for purchase online or can be ordered and picked up at their roastery. And for all the latest news be sure to follow them on facebook and instagram.